Labor day weekend eeked by me with nary a fun thing to report, though I did get to see Sheila E perform live at the Howard Theater on Thursday. It went to prove that I am still a little young, compared to those in attendance who remembered not only all of her songs, but all the songs by the opening act, formerly known as "The Family" o_O Booties were shaking lol. But that was it for my weekend. I mowed my front and back lawns, tended my gardens, and painted my dining room a shade of periwinkle. By myself. (forever alone? lol) I spackled the holes and pits, and sanded and blue-taped and everything :-) I was afraid to replace the furniture quite yet but I will post a pic when the now-floating table can go back where it belongs. Sooo my hair didn't really need to be done this weekend since I went nowhere. But I guess some sort of "hope" of a fun time lurking behind the next circuit of the hour hand kept me from totally protective styling it away. I wore my hair as seen below on Friday and just pinappled it most of the weekend. I co-washed it late Saturday, but essentially styled it right back to how it was. Then I got paint in my hair Monday. Just a lil bit lol. I finger smoothed most of it out, only to find more every time I looked in the mirror. I'm thinking, however, that when I finally do co-wash again that I want to put it in a braid and curl or twist and curl set. I want to begin doing those for the fall and winter to retain some length. 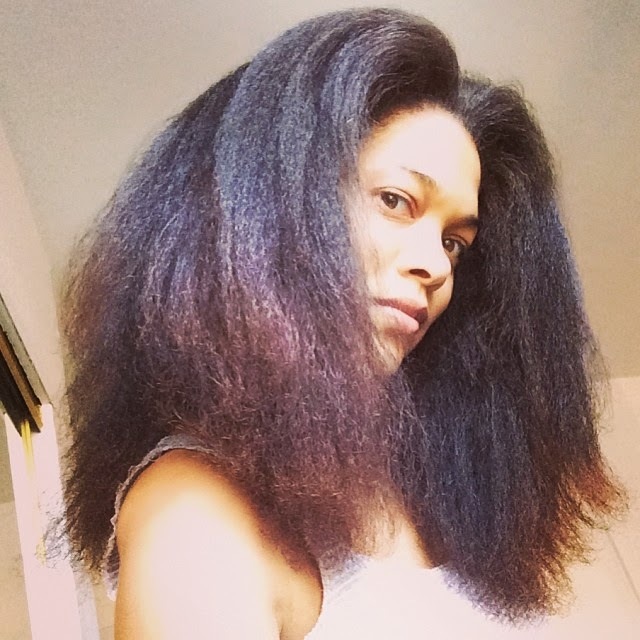 I've been trimming my hair often to offset the SSKs resulting from my wash&go habit. I prefer it a little shorter for many reasons but I realized that if I were to press my hair right now that it would look much as it did a year ago. I guess after several years of medium length hair I might be ready for longer hair again. You never know when that time may come. Or when it may go :-) After 11-12 years with no relaxer, length goals are not so much a factor as is diversity of styles.